A Cardboard Problem: Robbie Cano, don't ya know? For those of you that don't live within listening range of John Sterling on WFAN, that is his catch phrase for Cano doing something great. It is also what I say when new Cano cards come in the mail. No, I really don't. This is one of the other cards I snagged from my eBay sale of the Tim Lincecum patch card. 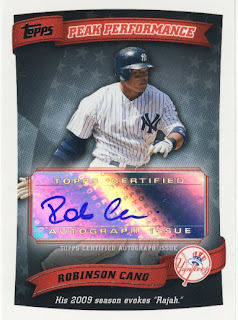 I picked up the 2010 Robinson Cano Peaker Performers autograph . I got it for a very reasonable price by comparison to what his cards have been selling for recently so that made me even more happy. I am still working on my photobucket sorting to make it organized, yet it never seems to look the way I want it to. I just created a Cano album and will eventually try and move all my scanned cards into that as a showcase. I think what I may end up doing is deleting the whole thing and just starting over. The only problem with that is that I may need to rescan alot of the cards and I don't have the motivation for that at all. How many of you guys used photobucket? Anyone use something else? Picasa Web Albums gets my vote for sure. Fast, easy to use, you can upload from your desktop via iphoto or picasa, 5GB of free storage...it's good stuff. This is what blogger uses as default for images, so if you've had any experience with that you should have a feel for it. I use Photobucket on occasion. I used to use it a lot when I did board trading but that has become a thing of the past for the most part. The Picasa album is where most of my stuff goes now. In an unrelated note, what does that mean on the bottom of that Cano card? I use flikr. It's where that side bar comes from on my site, and you can organize by album fairly easily. And John Sterling really should not be allowed to speak in public.